This table is proudly made in America by an Old Order Amish woodworker In Lancaster County, PA. Our Amish woodworkers feel that their woodworking skills are a gift from God that is poured into the beautiful furniture that they create. This Amish woodworker specializes in dining room tables and chairs and uses Old World craftsmanship techniques. Our Amish Grainvalley Drawleaf Extension Dining Table is available in four different sizes - all handcrafted in 100% hardwood. You can also choose a 30" dining height or pub table height for this Amish table. Two 16" draw extensions at each end of the table are included with the 36" x 54" and the 40" x 60" table. Two 20" draw extensions come with the 42" x 72" and 44" x 84" dining tables at the ends. The appeal of this farmhouse table is that you can stow away your table extensions easily inside the table. This farmhouse table is perfect for the kitchen or dining room. This is a great table for an apartment especially our 36" wide by 54" length! 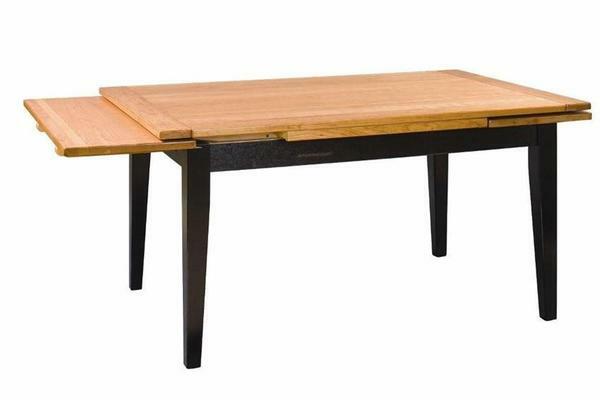 The hardwood that is used in the construction of this dining table is also sourced in the USA from sustainable forests. Choose to have the table built in your choice of oak, cherry or Brown Maple wood. We are happy to send out wood finish samples before or after you order to help you decide on the table stain or paint. Finish samples will also help you match the stain or paint up to existing furniture in your dining room or kitchen. Our furniture finish is resistant to water and other liquids however you still need to be sure to protect your table from liquids, heat and scratching. This table is also available with a two tone finish where the base and table top would be contrasting colors. For example the table base may be finished with a black distressed paint and the top may have a beautiful cherry wood natural finish. For the varnish you have the choice of a matte flat varnish or a semi gloss varnish with a slight shine but still not high shine. The options are endless and if you don't see what you want in the options then just give one of our Amish furniture specialists a call and they will be happy to help you in anyway that they can. This table comes with the option of a traditional simple skirt or our fancy French skirt both have a simple edge. There is no edge option for this dining table. We offer a wide variety of table legs for this table. By selecting the table leg you can transform the look and feel of the farmhouse table. Please note some of our table legs are not available with our counter height tables. How do the Stowleaves Work? The draw extensions operate on hinges and solid wood slides. The extensions normally rest underneath the table at the ends. When they are pulled outward from the stowleaf table, they slide over the center of the hinge and are raised upward. They are then drawn back against the edge of the stowleaf farmhouse table and lock in place for a very solid and sturdy fitting. There is no need to use closet space for your extensions with this handy stowleaf table. Our customers love the convenience of not having to lug heavy bulky extensions to the dining room with our solid wood Stowleaf Farmhouse Dining Table. This table involved minor assembly of attaching the table legs to the table top. If you upgrade to our white glove in home delivery service then the table will be assembled for you. Questions or Ordering Assistance on our Farmhouse Table? Please call one of our Amish furniture specialists today at 866-272-6773 for assistance in ordering this Stowleaf Farmhouse Dining Table as well as other heirloom furniture we offer at DutchCrafters. We are happy to help with stain samples and questions. Remember, at DutchCrafters you can order this gorgeous table with just a 30% deposit. All of our dining room tables at DutchCrafters are made in America. Length with Extensions In: 54"
Length with Extensions Out: 86"
Floor to Bottom of Skirting: 24"
Width between Legs: 40 1/4"
Three days after I sent that email I got a call telling me my stowleaf table was ready for delivery and would Friday be OK? And the delivery guys from TLC were wonderful. We just want to let you know how happy we are with our farmhouse stowleaf table. It has exceeded our expectations. We appreciate your attention to detail to ensure that we got exactly what we wanted. The craftsmanship is spectacular. We wanted a table that would fit in our small dining area, and yet expand for family occasions. The stowleaf table works perfectly for us. Also, it is gratifying to see work that reflects the character of the craftsman. Even though this table is newly-made, it is already an antique. It will still be in someone's living room long after the veneered particle board tables are moldering in some landfill. Thanks to you and the craftsmen who made it.